On November 7th Kimberlee's Bikes for Kids Bike Art Spectacular will launch in San Diego. The event will take place from 6-9 pm at the Quilt Art Vision Gallery at San Diego's hottest new venue, Liberty Station, located just outside the city's downtown. All monies raised will benefit Kimberlee's Bikes for Kids, a 501(c)(3) non-profit foundation that buys new bikes, helmets and locks for underprivileged children. "We are very excited to be debuting Kimberlee's Bikes for Kids Bike Art Spectacular at the Quilt Art Vision Gallery," says Dan Gindling, president of Kimberlee's Bikes for Kids, which honors Kimberlee Caledonia, a talented and avid cyclist who died of brain cancer in March 2008. 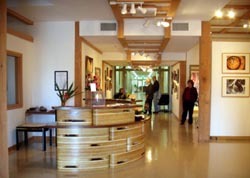 "The gallery is brand new, features professional lighting, and has an open and airy feel to it. Plus, being in Liberty Station is a real positive. The whole area exudes excitement and there's plenty of free parking." The Bike Art Spectacular will feature bicycle-themed art from all over the world, including England, Australia, Canada, and, of course, the U.S. The art will be displayed and sold at the reception on November 7th. In addition, the reception will include a silent auction, door prizes, drinks and appetizers. Remaining art not sold at the reception will be featured in a special eBay auction from November 9-16. "The support from the art community has been unbelievable," says Gindling. "We have artists creating one-of-a-kind pieces for the event, plus, in the next few weeks we will be announcing major contributions by a couple of world-renowned artists." The donated art will feature original paintings, limited-edition prints, hand-embellished giclee's, sculptures, photographs, recycled art, T-shirts, jewelry and cards which carry retail values from $5 to $5,000. For those artists wishing to donate to the Kimberlee's Bikes for Kids Bike Art Spectacular, please e-mail dan@kimsbikes.org or call (619) 692-1313 for details.